One of the results of the Information Age is a huge information overload, resulting in the prominence of visual communication in advertising. Because audiences have grown impatient and no longer want to read long articles, marketers have turned to representing their message through visual means. By using informative infographics or banner advertisements, you can effectively reach your target audience while also cutting down on time and cost. A basic understanding of graphic design, and acquiring basic graphic design skills will have a positive influence on your potential contributions in the workplace. Increase your knowledge and skill in graphic design with the University of Cape Town Foundations of Graphic Design short course. This course is presented part-time and entirely online throughout South Africa, in partnership with online education company, GetSmarter. Who should attend this course?This course is designed for anyone looking to acquire basic graphic design and visual thinking skills, and is particularly relevant to those working in creative industries, such as advertising professionals, general marketers, content managers, photographers, publishing professionals, web designers, bloggers and illustrators. Small business owners looking to expand their service offering to include design services (e.g. signage, printing, promotional gifts or events companies), or even establish a new business in graphic design, will also benefit from taking this course. 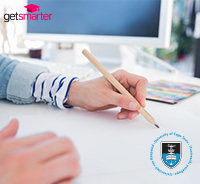 This course will also benefit self-taught or aspiring graphic designers who want to establish themselves in the industry.Visit www.getsmarter.co.za for more information or to view all 45 online short courses.